The League has asked: "What is your deepest, darkest geek confession?" While this would definitely be an ideal time for me to talk about my childhood Teen Beat magazine collection, that topic has been touched on already. So what's something I love that most (normal) people might scoff at in mockery? Just like anyone, I have my share of guilty pleasures. Near the top of that list? In 1987, the original Monkees were on the comeback trail. Someone somewhere got a bright idea to bring a similar zaniness to a new generation and the New Monkees were born -- Larry, Marty, Dino, and Jared. Their show was quirky...but fun. It aired in my area on Channel 11 out of St. Louis on Saturday afternoons and there was very little that could keep me from tuning in. Unfortunately, the show was cancelled after a quick run of 13 episodes. 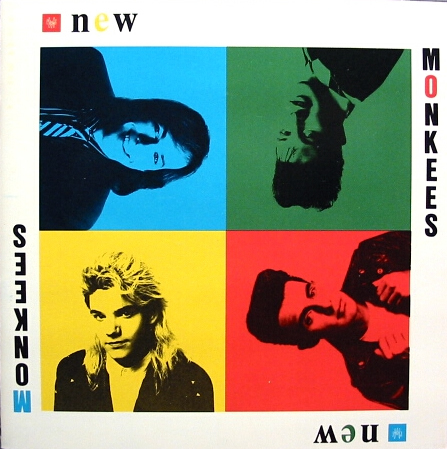 But my real excitement over the New Monkees came with their music which consisted of a pure 80's pop-rock style similar to what you'd hear from Kidd Video. I bought the album on cassette at the Evansville (IN) mall not long after it was released -- and I wore that thing out! Eventually I bought a CD copy which has continued to be a regular part of my music listening rotation for the past 25 years. I've picked up other New Monkees items over the years like a vinyl copy of the album and a 45 record of the single What I Want. One of these days I'll get around to grabbing one of the model cars that were produced. Several years ago, I stumbled upon a Yahoo group put together for fans of the New Monkees and quickly joined. One very generous member of the group was kind enough to provide me with copies of all 13 episodes as well as a full tape of unreleased New Monkees demos. I don't remember the name of the guy who sent this stuff to me, but I'm forever grateful! This group is actually responsible for one of the most exciting things in New Monkees fandom since the band's original run. You see, back in 2007, several members of the Yahoo group apparently pooled their funds and brought all four of the original New Monkees together for a reunion at a hotel in California. They played, they sang, they laughed, they had a great time. The reunion performance was filmed and photographed by several of those in attendance -- but for the rest (the majority) who were unable to attend, we were left in the dark. To my knowledge, other than one or two short videos on YouTube, this footage has never seen the light of day outside of those few lucky enough to be there first-hand. I suppose I've resigned myself to the fact that I'll never see the reunion video, but I'm still holding out hope that someday it'll surface in its entirety. But in the meantime...I'll continue to play their music often and play it loud. Nice! I didn't even know this existed! Thanks for sharing! this is exactly the sort of pop culture weirdness I LOVE. I'm clicking through your blog now and see that you're a fellow record collector. I'm a huge LP collector myself - I don't play CDs or digital crap. I'm definitely subscribing to your blog! 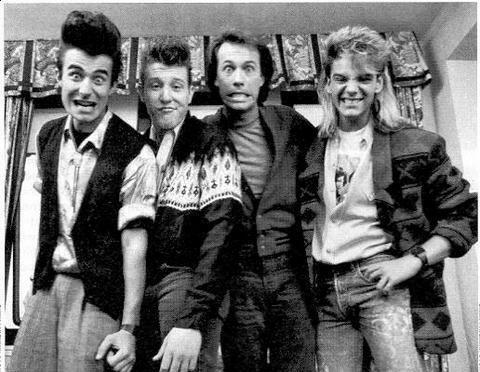 Christopher -- After listening to these guys for 25 years, I have to remind myself that most people, even from the 80s, have never heard of them! Seriously, I have no recollection of these guys at all, but I love the fact that they had such a loyal following, especially in the days before the internet. WOW...I listen to some pretty extreme Metal....but THAT was scary !! Ha! That's what makes this a guilty pleasure and my "secret confession." Awesome. I vaguely remember these guys. And you are right, Tim, they do sound like Kidd Video. It looks like all the band members actually play, too. Nice one.